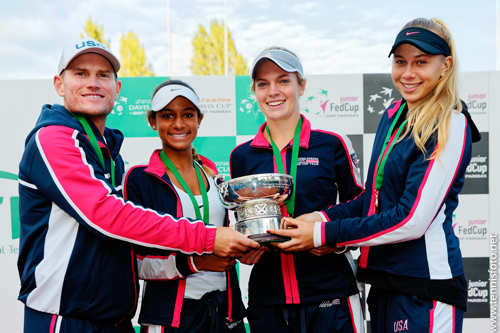 The US girls on this year's Junior Fed Cup team have had their share of second place finishes in ITF team competitions. In 2015, Caty McNally and Amanda Anisimova lost in the 14-and-under World Junior Tennis final to Russia and last year fell to Poland in the final, both by 2-1 scores. Whitney Osuigwe was on the 2016 World Junior Tennis team that finished second to Ukraine, again by a 2-1 score. This year, all those memories were pushed aside, with McNally and Osuigwe winning their singles matches to give the top-seeded Americans a 2-0 victory over second-seeded Japan. At No. 2 singles, McNally avenged her loss last month to Naho Sato, posting a 6-3, 6-2 victory. Osuigwe, taking the No. 1 position again after Anisimova was unable to play due to illness, fell behind two breaks at 4-1 to start her match with Yuki Naito. She immediately got one break back, but Naito served for the set at 5-4, and when Naito couldn't close it out, Osuigwe capitalized, winning the next seven games to take the first set 7-5 and go up 4-0 in the second. Naito did her best to fight back, breaking Osuigwe serving at 4-0, but Naito lost her serve again to give Osuigwe an opportunity to serve for the match. I counted four match points saved by Naito in that game, but the scoring box on the live stream was often not accurate, so I can't be positive. Naito held for 5-3 and another long game ensued with Osuigwe attempting to serve it out again, with two more match points saved by Naito, but a backhand winner gave Osuigwe her seventh match point and she converted when Naito's forehand return of an Osuigwe first serve found the net for a 7-5, 6-3 win and the title. This is the fourth Junior Fed Cup title for the United States since the competition's inception in 1985, with all of those coming beginning in 2008, with 2012 and 2014 the other two. For more on the final, with quotes from Osuigwe, McNally and Captain Erik Kortland, see the ITF junior website. The US boys, seeded third, fell in the final to top-seeded Czech Republic 2-0. Jonas Forejtek beat Will Grant 6-4, 7-5 at No. 2 singles and 14-year-old Dalibor Svrcina defeated Govind Nanda 6-2, 6-2 to clinch it. The Czech team did not drop a match in their five victories. For more on the Junior Davis Cup final, see the ITF junior website. For more photos from Budapest, see Richard van Loon's album at tennisfoto.net. 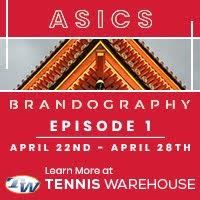 The ITA Oracle Masters crowned two new champions today, with North Carolina freshman Alexandra Sanford taking the women's singles and Southern California's Brandon Holt claiming the men's singles title. Sanford, the No. 6 seed, defeated top seed and defending champion Ena Shibahara of UCLA 5-7, 6-3, 7-6(11), saving five match points in the tiebreaker that decided the two-and-half hour match. The 18-year-old from Ohio was up 2-0 in all three sets, but with no-ad no lead was safe and in the third set, Shibahara served for the match at 5-4. The Bruin sophomore didn't earn a match point, with two double faults contributing to Sanford's cause, and two service holds later, they went to a tiebreaker. Shibahara's first match point came at 6-5, and she had a look at a Sanford second serve, but she missed her return. Sanford then earned her first match point with a backhand winner set up by a good first serve, but she missed a backhand on the next point to make it 7-7 and waited a long time for a second match point. Shibahara's second match point was brushed away by Sanford with a good first serve and a forehand winner, but after a Sanford error, Shibahara had a third match point, this time on her serve. She missed a forehand wide to make it 9-9, but went up 10-9 with a forehand forcing a Sanford error. On match point No. 4, Sanford's aggressive down the line forehand forced an error, but she missed a backhand on the next point to give Shibahara her fifth match point at 11-10. Shibahara's forehand caught the tape and dropped on her side of the net to make it 11-11, and, on the next point, when there was no call on Sanford's shot near the baseline, which Shibahara pleaded with the chair for an out call, Sanford had her second match point. She didn't get a first serve in, but Shibahara's forehand found the net, ending the dramatic battle in the rookie's favor. No. 2 seed Holt defeated unseeded Victor Pham of Columbia 6-3, 7-6(2). After a messy first set, with only two holds of serve, both by the Trojan sophomore, the second set was tighter, with ten straight holds sending it to a tiebreaker. Pham had found himself in a similar position in the semifinals against top seed Petros Chrysochos of Wake Forest, and had won the second set tiebreaker and the third set 6-0, but Holt did not allow Pham to get any momentum, going up 6-0 in the tiebreaker and cruising to the title. Saturday night, Holt and Shibahara claimed the mixed doubles title, beating Samantha Harris of Duke and Johannes Schretter of Baylor 8-1 in the final. 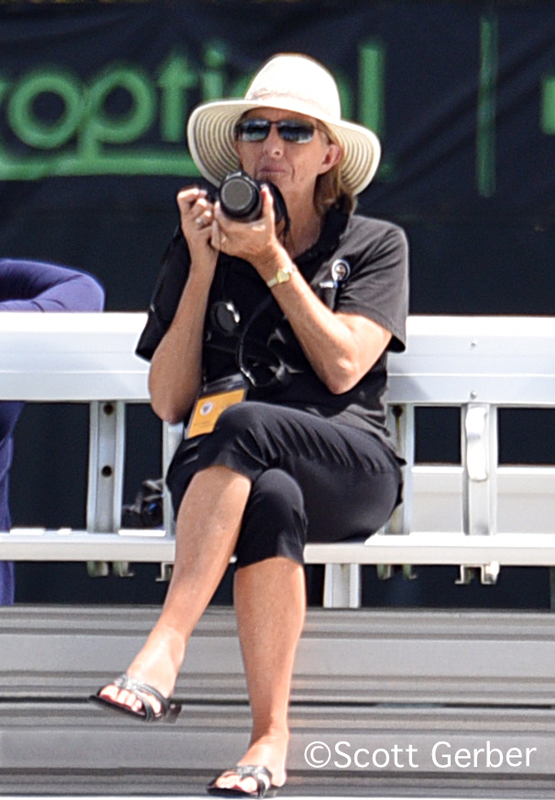 For draws and recaps, see the ITA tournament website. Emina Bektas won the $80,000 Women's Pro Circuit tournament in Albuquerque New Mexico, defeating Maria Sanchez 6-4, 6-2. It's the first title for the former Michigan star above the $10,000 level and she can now begin thinking about 2018 Australian Open qualifying, with her ranking moving from 350 to ~234. Tara Moore of Great Britain and Conny Perrin of Switzerland won the doubles titles, beating top seeds Viktorija Golubic and Amra Sadikovic of Switzerland 6-3, 6-3 in the final. At the $15,000 Futures in Laguna Niguel California, No. 4 seed Ryan Shane took the title, the third of his career and the first this year, beating unseeded Henry Craig 6-3, 6-3. Shane also won the doubles title on Friday, with Ronnie Schneider. Ante Pavic of Croatia won the $75,000 ATP Challenger in Columbus Ohio, beating Alexander Ward of Great Britain 6-7(11), 6-4, 6-3. Denis Kudla and Dominik Koepfer of Germany won the doubles title, beating Luke Bambridge of Great Britain and David O'Hare of Ireland 7-6(6), 7-6(3). At the $25,000 Futures in Canada, former Indiana standout Sam Monette of Canada won both the singles and doubles titles. Monette, seeded No. 8, beat top seed Sam Barry of Ireland 6-3, 7-6(4). Monette and former Harvard star Nicky Hu won the doubles, with the top seeds beating Gary Kushnirovich and France's Yanais Laurent 6-0, 6-2 in the final.